With the official RTM release of ASP .NET Web API, Microsoft took away the inbuilt support for OData that had been present on the earlier beta and release candidates. The official message is that there will be a far more complete release in the future, which will include additional query terms like the much-requested support for $select, $expand and $inlinecount. Nevertheless, this package has not been updated since it was originally released last August. Ultimately meaning that it misses plenty of enhancements and bugfixes that have been released since then. The resolution of this issue requires the removal of the Web API OData 0.1.0-alpha-120815 package and importing the OData dll from a daily build of the ASP .NET Web Stack. Clone the source for the full ASP .NET Web Stack with your favourite git client. Git Extensions is my weapon of choice. Open the "Extensions.sln" solution within the root folder, and get building. Note that you will have to either remove the "code signing" options in the project properties or supply your own signing key. 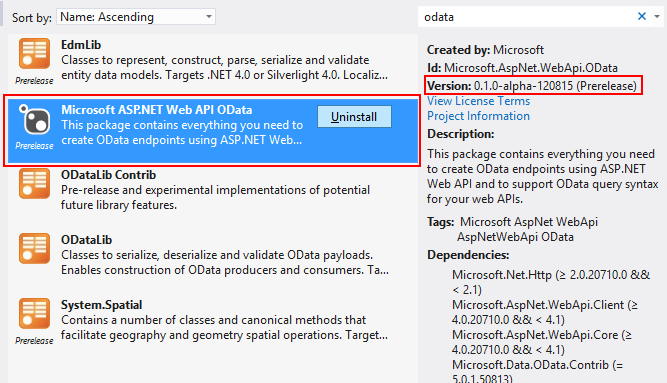 And there you go, you now have a Web API project the includes the freshest OData updates.